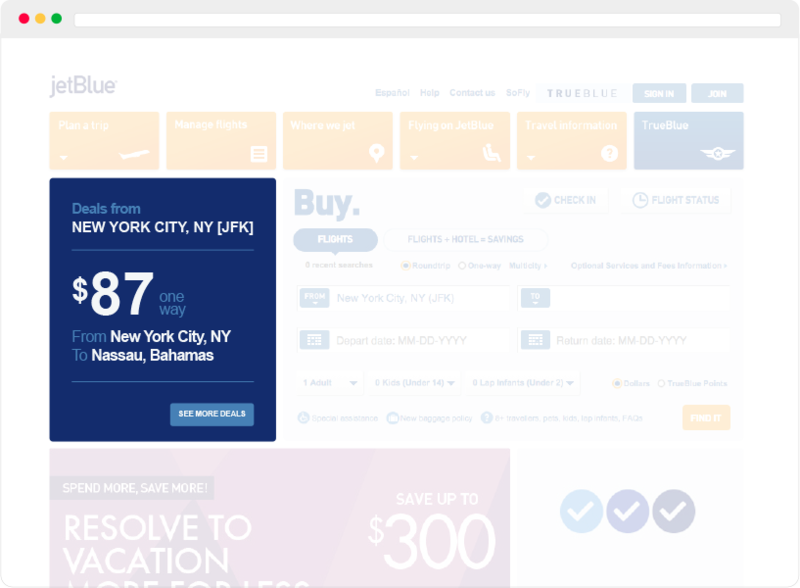 By using Qualtrics and a little early morning coffee, JetBlue boosted its Net Promoter® Score by 12 points in one year. At JetBlue, a one point increase means an extra five to eight million dollars in annual revenue. You do the math. Qualtrics empowers airlines to provide a peerless customer experience at every touch point. This means customers are thoroughly taken care of from the time they book their flight online, to picking up their bags at the carousel. You can also use Qualtrics to make sure the check-in, terminal, and in-flight experiences are as seamless and enjoyable as possible. 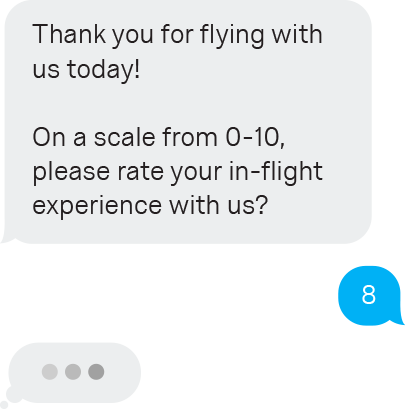 Using our survey platform, your airline can gauge how customers feel and understand what they’re thinking. This includes customer satisfaction surveys, web and mobile feedback, Net Promoter, and real-time, closed-loop feedback — to see how satisfied your customers are and how likely they’ll recommend flying on your airline. From there, you’re able to take a proactive approach by spotting trends and addressing problem areas in real time. In the end, using Qualtrics leads to major leaps in brand loyalty and retention. Pair that with an increased Net Promoter Score and you have an airline that will stay at top flight. With Qualtrics SMS and mobile surveys you can seamlessly connect and communicate with your customers the same way they communicate with their friends. With Qualtrics’ Bain-Certified NPS questions, you can combine in-moment and long-term passenger satisfaction feedback, creating a more complete vision of the passenger experience. Capture passenger satisfaction related to individual customer transactions or overall customer satisfaction. Perform rapid, ad-hoc research and run experiments as quickly as you can think of them. Immediately relay passenger feedback to the employees who can take action. Track and compare your passenger’s satisfaction regarding their pre-flight, in-flight, and post-flight experience. With dynamic, role-based dashboards the right people can visualize the data they need in real time on any device. Engage users to understand exactly what they are looking for, then provide the targeted promotions, offers, and invitations necessary to boost ticket sales. Interact with users on their mobile device as they research your airline, then provide the targeted invitations and experiences that drive greater engagement. Qualtrics makes conducting market research easier than ever before. With Qualtrics, you can conduct research ranging from ticket pricing and amenities, to determining service priorities, promotion testing, and online purchase driver analysis. No matter what type of insight your airline is looking for, Qualtrics can make it happen. 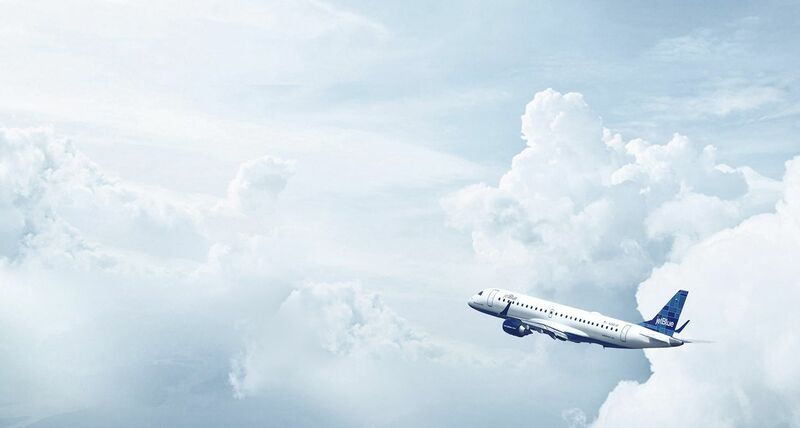 To date, we’ve helped our clients with passenger preference research, frequent flyer program assessment, airline competitive benchmarking, and much more. With Qualtrics Market Research, your airline can dive deeply into what drives passenger loyalty, fully understand your market, and find opportunities for growth. Quickly test ads and promotions or perform passenger preference research. Understand the value your customers attach to unique products and services offered by your airline. Leverage highly valued features to optimize the customer experience without breaking the bank. Track customer behavior across unique segments such as loyalty tier, spend tier, or traveler type. Tailor actions based on the value associated with each segment. Take your level of customer understanding beyond "who is buying" to truly understand "why they are buying." Dive into the lifestyle, behaviors, and habits that influence customer purchase decisions. Test new features or processes to quickly understand how they can positively impact the customer experience. Test throughout the entire journey and across every channel. Gather customer feedback on new products early in the development cycle to save time and money. How is your brand perceived across the unique consumer segments that make up your customer base? Easily track brand perceptions to capitalize on strengths while addressing weaknesses. Which direction is your industry headed in terms of processes, products, and services? Keep a pulse on industry and market trends to keep your company ahead of the curve. Understanding what, where, and why your customers are buying allows you to better meet passenger needs and attract additional business. Understand what travelers prefer during the booking process and why segments behave differently online. Deliver the features and options digital consumers want so you can increase bookings. Happy employees equal happy customers. Any questions? Qualtrics Employee Engagement makes it easy to transform data into actionable insights for your airline’s employees — from executives to front-line crew members, no matter where they’re located. 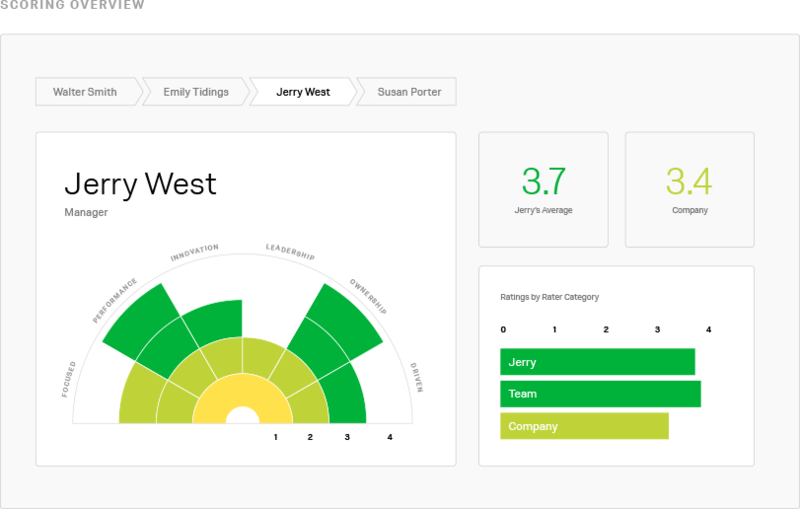 Qualtrics gives you the flexibility to customize role-based dashboards so you can compare your team’s performance to other departments or drill down to view specific insights about individual employees. Build a better workforce with fast and customizable 360 employee reviews. Discover what truly motivates your employees so you can improve and grow your business from the inside-out. Discover how passionate your employees are about their work and how proud they are to work for your company. Qualtrics makes it easy to grow your business from the inside out. See how to improve and tailor the onboarding process so every employee hits the ground running and easily integrates. Learn why employees leave and pinpoint areas for improvement that can help retain and build a stronger workforce. Qualtrics gives you the flexibility to ask any employee any question at a moment’s notice.